Dentist-prescribed in office whitening (bleaching) is a great teeth whitening alternative. How does dentist-prescribed home whitening work? Teeth whitening is the process of removing most stains from the surface of the teeth to make them whiter and brighter. Teeth become discoloured over time due to aging, diet and health habits. Smoking, red wine, coffee, tea and certain medications are some items that cause staining of teeth. Modern whitening procedures and techniques, supervised by Fairlawn Dental Centre can have a dramatic effect on your smile. Fairlawn Dental Centre uses modern techniques and materials and creates customized whitening trays to fit perfectly over your teeth. Once you have decided to whiten your teeth, your Ottawa dentist Dr. Jaleel will need a couple of appointments to begin treatment. At the first appointment, impressions will be taken of your teeth. These impressions are sent to a lab so the technician can fabricate the whitening trays. At the second appointment your whitening trays will be tried in to check the fit and you will be taught how to use the whitening material that has been chosen by Ottawa dentist Dr. Jaleel. A shade of the present colour of your teeth will be recorded. This shade is used as a comparison to assist in monitoring the progress of the whitening. Bleaching materials are available in different strengths. These strengths will be prescribed as needed by your dentist Dr. Jaleel. Usually a 3-6 week treatment is recommended, but this can vary depending on the amount of existing discoloration and the amount of whitening required. Teeth may become sensitive during the bleaching process, which usually subsides once treatment is completed. 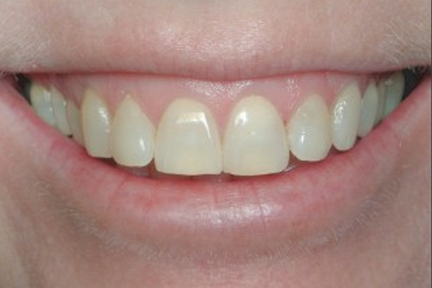 Sensitivity may be more intense if defective fillings with open margins exist in the mouth. The whitening material may seep into these open areas and irritate the nerve within the tooth. Any defective fillings should be replaced prior to bleaching. Bleaching may be indicated before any esthetic fillings are placed, to obtain a more pleasing final shade for your teeth. Several weeks should be allowed between bleaching and the final placement of the restoration to allow for some regression of the bleaching, which normally occurs. If white fillings are already present, and you want to have your teeth bleached, the fillings themselves will not lighten in color, and therefore will probably have to be replaced after the bleaching is completed. For further information, please speak to one if our amazing dental hygienists or Dr. Jaleel.